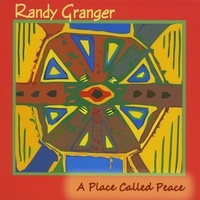 Native American flute player and percussionist Randy Granger displays his versatility on A Place Called Peace, an album kicked off by the title vocal track (Za Zee Za Zu Zing) exploding with cheerfulness and energy, buoyed by thoughtful lyrics. Besides playing flute and singing, Granger also displays a strong hand on the hang drum (an instrument which continues to gain in popularity). Talk about firing up a CD n the first song! It's not often (as primarily a reviewer of instrumental music) that I hear a vocal which makes me think "Boy, I hope the artist sings another one" but that was my reaction here. After this opening cut, the remaining seven tracks are all instrumental, encompassing a variety of tempos and moods. The Dog Star is a plaintive and haunting solo flute number, and, I would suspect, perfect for star-gazing in the clear desert sky. Granger has excellent technique on the lower register flute which he plays on this piece. Chaco Moon Meditation veers from its title's evocation by virtue of its fast tempo hang drum rhythm and the relatively uptempo nature of the flute. However, Granger's flute work here is still haunting enough to perfectly capture the image of a moon being "chased" by wispy clouds. Ghost Dancers evokes a strong Native American influence with tribal drums and traditionally-pitched wooden flute. There is an inherent sadness at work here, as well, and over-dubbing Granger's flute with accompaniment on other flutes only lends more power to the song. The higher pitched flute solo in the track's midsection might send chills down your spine! The soothing yet plaintive Grande Lullaby made me long for more like it. The cut reminds me of Coyote Oldman's recordings, which is meant as a huge compliment. Apache Tears once again combines tribal drums (as well as shakers) with Granger's flute once again illustrating a notable Native influence. The music flows along on currents of sadness and regret as well as bearing the majestic beauty which this wooden instrument alone seems to be able to covey. Double-Barrel Train Wreck has to be heard to be believed...Granger plays as if he has a third lung! I got tired just listening to this astounding display of breath control and musicianship! Closing out the CD is Ancestor's Ocean Voyage, the most energetic and highly charged song on the album, featuring not just flute and drums but also didgeridoo. Propelled by energy and passion, the cut sandwiches its vitality between opening and closing passages featuring what the liner notes refer to as "ocean drum." Randy Granger's name deserves to be listed with other renowned Native American flute players, both Native and Anglo, because he obviously has both the chops and the artistry to warrant it. A Place Called Peace illustrates that he is not just a gifted multi-instrumentalist but that he "feels" the music with a sincerity and emotional honesty which can't be faked. I solidly recommend the CD and I'd encourage the artist to continue exploring the incorporation of vocals among his strong instrumental work. That first song out of the chute really caught my attention!